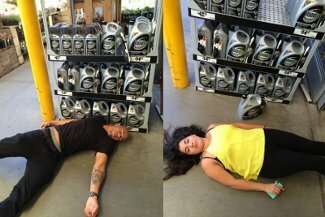 Long Beach: What the frack?! On Tuesday, March 24th, the state of California held an "Aquifer Exemption Workshop" to show oil industry representatives how to exploit loopholes for drilling and disposal projects to obtain aquifer exemption approval. 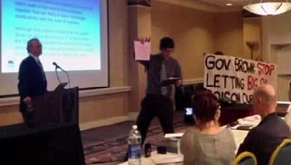 Concerned water drinkers interrupted the state-sponsored workshop on how to get away with poisoning our drinking water. As the presenter at the podium droned on about "EPA Aquifer Exemption Criteria," one woman stood up from her banquet table to declare: "I just have to say one thing. This is backwards. It was just announced in the news that industry injected 2,500 wells illegally... Shouldn't you be having a workshop on how to stop that instead of how to get around, to get exempt from these regulations?" Another woman entered the room waving two bottles of brown liquid. "I actually brought some poisoned water to show everyone what we're going to be exposed to and forced to drink if this poisoning of our water by our regulators continues." Approaching the podium and handing out the poisoned water, she asked, "Would you feel like drinking this water?" While the broad population, through its taxes, has been helping to start the electric vehicle business, the benefits of electric cars and plug-in hybrids isn't being distributed evenly. The charging times can be reduced to half an hour or so with charging stations that deliver electricity at a higher current, and a higher voltage. Thus, electric vehicle owners are dependent on high-current charging stations to get a quick charge. 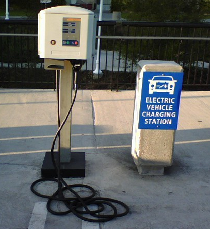 Areas without charging stations are “high risk” areas in which one might find themselves unable to reach a charging station before the battery runs out. In Los Angeles, these areas are East LA and South LA. A look at the map (at the Plugshare website) shows high densities of charging stations downtown, in Hollywood, and on the westside and Santa Monica, where wealthier people live. 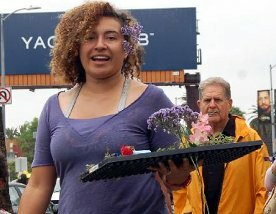 HOLLYWOOD -- On Saturday May 24th, people from the Los Angeles area responded to the global call to action for a "March Against Monsanto" by collaborating to produce an urban gardening festival with the theme "It's time to take back our food!" The day started at 10 AM at vegan café Elderberries (7564 Sunset Blvd), where 3,000 edible, organic seedlings were on hand for distribution during the "Plant Against Monsanto" portion of the day. Kale and tomatoes were just a few of the open-pollinated non-genetically engineered (GE) varieties given away. Volunteer Morgan Peters was one of the people to address the crowd, "There is a lot you can do on a daily basis. There's a lot going on right now in California. There's a bill in the senate that will be voted on next week (looks like it will be Wednesday), and it's for labeling GMOs. It's called SB 1381 and it's just like Prop 37 except it's a little cleaner, streamlined, a little fresher." Hahamongna is a Native American village site at what's now the base of JPL (Jet Propulsion Laboratory) and currently threatened by an overly-elaborate plan to renovate Devil's Gate Dam. This plan involves defoliating the area. Alternative plans would spare the ecosystem; however, the more grandiose one seems to be favored because more money is involved. 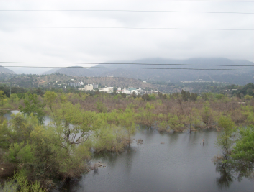 Those interested in a more sustainable approach to cleaning Devil's Gate Dam are encouraged to contact their city council members (if residents of Pasadena) or Supervisor Michael D. Antonovich (if residents of Los Angeles County). The Arroyo Seco Foundation conducts regular tours, not only of Hahamongna Watershed Park (known for many years as Elk Grove Park) but the surrounding areas, identifying the many uses of local native plants. Participants of the 4th Annual Hahamongna Walkabout (and Bikeabout) learned about local Indigenous culture and got to eat pancakes made from local acorns and sample chia seeds and elderberries.